Just when you see the Gardens is busy, busy, busy with shoppers and sellers, it takes a matter of a few steps to disappear away from the crowds. At Spring Plant Sale, I certainly drooled my share over the water-smart plants and flirted with other blooms in the diversity of sections. But I wound my way back towards the front by stepping off the wide, busy pathways and meandering through the Woodland Mosaic. And I was arrested by a scent. It wafted from out of the woodland, beautiful, sweet and distinct. It was not a vague perfume—the plant was near, somewhere. I settled my gaze on a smooth-barked tree, just within reach. Yes, this was it. Clusters of small white flowers and a pinnately compound leaf. It's very easy for non-gardeners to appreciate such trees from a distance ("Oh, pretty. Let's keep walking.") but for those with the curiosity or wisdom to inspect it, it's a horticultural poem of lingering spring. Despite the coming summer heat, today is cool, moist and rich in that garden. And once I smelled it, sweet. When I first examined it I looked over for a sign or label, but its either missing or covered over by a sly herbaceous leaf. Still I thought I recognized it; I believe it is a Sorbus, and Gardens Navigator lists Sorbus aucuparia in the Woodland Mosaic. That's the European Mountain Ash or Rowan, but there are other species from around the world. As I returned with my small camera, the Gardens' official photographer Scott Dressel-Martin took pity on me and my point-and-click. 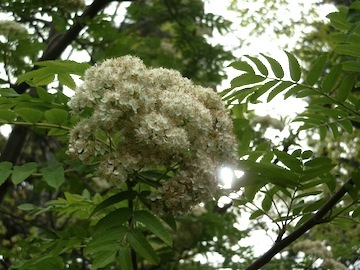 He found and took this image, with sun passing genteelly between the leaves and the bloom. I think that is another feature of the crowds at the plant sale; they may be focused on shopping, carrying flats, and getting to their next stop, but they will stop, and share and appreciate. As fun as Spring Plant Sale is for me, as enjoyable as it is to ask the gardeners in the checkout line what they are buying and why, it's really clear there is a further, later pay off. We stock our gardens with plants we want, plants that will perform, plants we covet, and plants to help our corner of the planet. But we're each hoping for the joy of experience, of being in an inviting, welcoming space that enchants us with scent, with color, with blooms, with shelter and abundance. By all means, shop the delights at Spring Plant Sale. And by all means, step into the Gardens and share an experience to remember.